We examine the role of different forcings on the subtidal circulation in a microtidal bay with freshwater inputs in the NW Mediterranean Sea: Alfacs Bay. Observations of subtidal flow in summer 2013 and winter 2014 reveal a two-layered, vertically sheared circulation. During the summer, there is a significant positive correlation between surface currents and winds along the main axis of the bay, while a negative correlation is observed between wind and the bottom layers. During the winter, the cross-shore response is correlated with the most energetic winds, showing a two-layered vertical structure inside the bay and a nearly depth-independent water motion caused by high wind speeds at the bay mouth. The vertical structure of the velocities, as determined through empirical orthogonal function analysis, confirms that surface layers are affected by winds and bottom currents correlated negatively with winds as a response of the wind set-up. Seasonal mean circulation reveals gravitational exchange at the bay mouth during the summer. However, mean circulation is unclear in the inner bay and close to the drainage channels. Observed flow patterns are supported by modelling results that confirm the persistence of averaged current in the low-frequency dynamics. Re-circulation areas in the inner bay indicate the rich spatial variability in flow at low-frequency time scales. 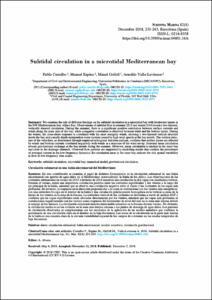 Cerralbo, P., Espino, M., Grifoll, M., ValleLevinson, A. Subtidal circulation in a microtidal Mediterranean bay. "Scientia marina", Desembre 2018, vol. 82, núm. 4, p. 231-243.